Review of the Porky Payout Video Slot, February 2007. 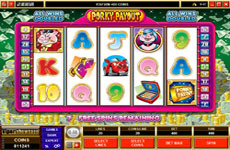 Porky Payout slot is a great new 5 reel, 20 pay-line video slot game called PORKY PAYOUT that is full of excitement and rewards! This little pig came to our Casino....and found this great game. We're not sure what the other little pigs did but this one certainly discovered a world of fun and action with Wild, Scatter and Bonus opportunities aplenty and big winning potential. Jackpots worth $150,000 are achievable in the base game, and a further $120,000 is available on the generous bonus feature, triggered by 3 or more glistening gold brick Scatter symbols. These power-up a yellow brick wall of 9 choices where the player can select six prizes that can boost the triggering bet by an incredible factor of 600! And if that's not enough, keep a lookout for the cigar-smoking and successful Capitalist Pig who is the Wild symbol in this game. Porky can complete winning and rewarding combinations on bets as low as $0.01 all the way up to $200 on this smooth, fast video slot. With fun cartoon graphics featuring the pink pigs and their cars and jewelry, Porky Payouts is a game that provides loads of entertainment and the possibility of significant winnings so follow the example of the first little pig and trot along to our Casino to try it out!